An early 20th century villa built in elegant Italian Liberty style, set in peaceful gardens, on the shores of Lake Garda: Hotel Regina Adelaide is the kind of place in which dream holidays (and weddings!) come true. Luxurious wall coverings, soft, sweeping drapes, polished parquet floors, and marvelous views over the gorgeous gardens: Hotel Regina Adelaide's bedrooms and suites have been custom-made for romance! After a good night's sleep, make your way to the hotel's welcoming bar or the sun-kissed terrace for a leisurely breakfast of homemade cakes and coffee. Sauna, steam baths, aqua gym, massages and a vast range of face and body treatments: if it's professional pampering you're after, you couldn't choose a better place to find it than Regina Adelaide's state-of-the-art wellness center! Tantamount to gourmet heaven, Regina Adelaide's Regio Patio restaurant is run by Andrea Costantini, the onetime pupil of Italy's celebrity chef, Bruno Barbieri. Costantini's à la carte menu is accompanied by a superb 300 bottle long wine list, personally compiled by the manager Stefano Barbieri and the hotel's sommelier, Alexandra Marcher. Say "I do" on the shores of Lake Garda! If you're looking for a dream location for a water-edge wedding, you can stop, because we've found it: Regina Adelaide! 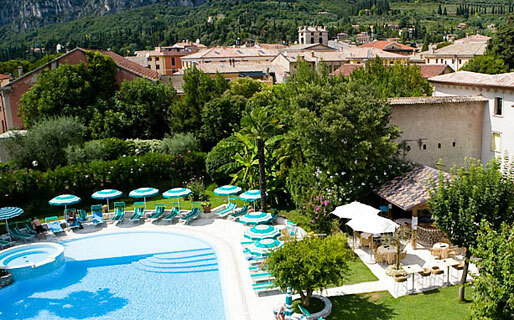 From the catering to the floral decorations to special spa treatments for the bride-to-be: choose this fabulous four star hotel in Garda for your wedding celebrations and leave the rest to Regina Adelaide's expert event organizers! In the pretty town of Garda, within minutes of Italy's largest lake, the four star Hotel Regina Adelaide is the perfect choice for a relaxing holiday on the shores of Lake Garda. Want to explore? It will take you less than 30 minutes to reach Verona, Valpolicella and Monte Baldo.